Campbell Scientific Aust presents the CWS220A, a wireless version of their SI-111 infrared radiometers designed for surface temperature measurements using a non-contact method. CWS220A wireless infrared radiometers contain an internal 922 MHz spread spectrum radio that transmits data to a CWB100A wireless base station or to another wireless sensor employing a frequency commonly used in Australia and New Zealand. A wireless sensor can route its transmissions through up to three other wireless sensors. A datalogger is connected to the CWB100A base station for processing and storing the CWS220A's data. Wireless infrared radiometers are useful for making measurements in locations where the use of cabled sensors is problematic. Protecting cables by running them through conduit or burying them in trenches is time consuming, labour intensive, and sometimes not possible. Local fire codes may additionally preclude the use of certain types of sensor cabling inside of buildings. In some applications measurements need to be made at distances where long cables decrease the quality of the measurement or are too expensive. 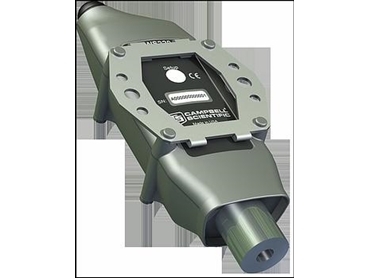 There are also times when it is important to increase the number of measurements being made but the datalogger does not have enough available channels left for attaching additional sensor cables.